This site is close to Sharston roundabout tucked away in a quite cul - de - sac next to an existing private development. The site was acquired by WCHG in 2015 and contained at the time a fire damaged convent which had been derelict for several years. The convent was demolished and has been replaced by a 4No. 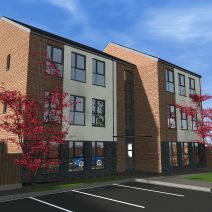 3 storey 2 bed townhouses for shared ownership and 6 No. 2 bed apartments for affordable rent. Completion of the scheme is expected in May 2018.